Made of heavy gauge steel. 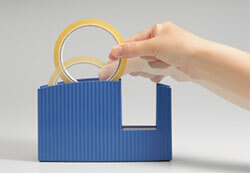 Holds 1" or 3" core tape. Designed for easy portability. 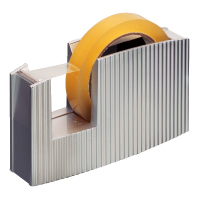 PVC-coated sheet base prevent from slipping or scratching. Weight 1.3 kg. Black, white or silver. Made of heavy gauge steel. 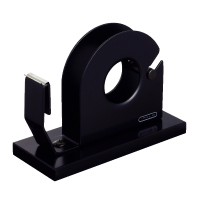 Holds two 1" or 3" core tapes in one or opposite way. 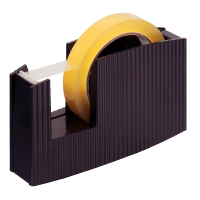 PVC-coated sheet base prevent from slipping or scratching. Weight 1.6 kg. Black, white or silver. Can turn a tape way by Phillips-head screwdriver. 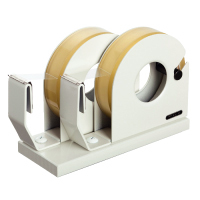 One-touch, easy-to-load "flip-slot" mechanism tape dispenser simply insert a tape into the body with no need to fix with built-in core. Slim yet solid construction made from ABS plastic. State-of-the-art "flip-slot" mechanism just insert a tape into the body. After consuming the tape, simply pull out the tape core. Basic model. 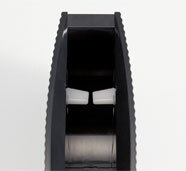 Accomodates 3" core tapes (*less than 24 mm width tapes) only. Do not use 1" core tape. Size: W50 x D175 x H105mm. 3 colors available. Metallic model. Brilliant metallic colors to create distinctive atmosphere at your office or shop counter. Accomodates 3" core tapes (*less than 24 mm width tapes) only. Do not use 1" core tape. Size: W50 x D175 x H105mm. 5 colors available.